Following a heavy Christmas of booze, banter and “bad b*tches”, Idle returned with a bang in 2018 as they faced last season’s title rivals, Leeds City Old Boys in Division 1. Renewing old rivalries has been a theme this season with 4 teams securing promotion from Division 2 last year and it was in fact this very fixture that secured the title for the Bradford side last season. Both teams were at full strength and Idle welcomed the return of Luke Chandler, a self-proclaimed Phil Neville and he’s certainly versatile, playing every position badly… On a serious note, the big man provided another influential voice in the team, hopefully giving Marcus Strudwick a break. It’s about time the man had a day off! Idle started the game on the back foot with Leeds City playing a possession game, keeping the ball well and moving it out from the back. However, Lee Cookson and M. Strudwick marshalled the defence well in the early stages ensuring that the lads were organised against the probing attacks from the opposition. The only real threat from the home side came from corner kicks. With Idle defending well, the game was set-up perfectly for quick counter-attacks which the blues generally excel at and it was the away side who opened the scoring. After winning the ball back in midfield, the ball found its way up to striker, Aaron Irving who did well to get the ball under control and with Jack Strudwick in support, the two players picked holes in the Leeds City defence with quick one-two passing before Strudwick applied the calm finish past the goalkeeper. Rob Brook’s side were certainly starting to get a foot-hold in the game and it wasn’t long before the lead was doubled. Adam Medley was giving the Leeds City right-back a torrid time with his pace and close dribbling and it was his delivery from the left which set-up Idle’s second goal of the day. After turning the right-back inside out, Medley delivered the ball into the box towards Tom Simonett who’d made the “run” from central midfield into the box. Simonett couldn’t quite reach the ball with his head, however, luck was on Idle’s side as the ball deflected off the defender, deceiving the keeper and finding the back of the net to make it 0-2. Leeds City managed to get back into the game thanks to a period of sustained pressure on the Idle defence and forcing a number of consecutive corners. A momentary lack of organisation in the Idle ranks saw the attacker wriggle free of his marker to turn home the incoming cross to make it 1-2. The momentum could have shifted in favour of the home side at this point but Idle weren’t to be deterred and took the game to Leeds City again. Following some great work from Ryan Mitchell down the right hand side, the winger managed to dig out a perfect cross to Medley on the opposite side whose powerful volley found the roof of the net, giving the keeper no chance to make the save. It was 1-3 and half-time soon followed. Anyway, that being said, Idle were actually playing quite well and started the second half strongly. It was going to be an uphill battle (literally) for the Idle defence in the second half playing up a slight gradient and the wind picking up. However, the lads were defensively sound for the majority of the second half. Carl Brown and Danny Rosconie were playing well at left-back and right-back respectively, not giving the opposition wingers’ any chance to get a cross in and snuffing out most attacks from wide areas. An injury to Carl Dawson early in the second half saw Tom Holmes replace him in central midfield and Holmes got through some solid work during his 40 minutes on the pitch. Not to mention picking up the quickest booking in the history of football receiving a yellow card from the referee after a solid 20 seconds on the field. In fact, I think he may have been booked for getting his own name wrong when asked by the ref on entering the pitch. Meanwhile, the performance of the match came from M. Strudwick between the posts for Idle. The Idle defence did well to keep most of the play in-front of them but Strudwick was on hand to make some fantastic saves when required, channeling his inner David De Gea to tip several goal-bound shots around the post. One save in particular saw him fly through the air to claw the ball out from the top corner! Some may say it was just for the camera’s and thank Christ Joe Richards wasn’t filming at that point as we wouldn’t have seen the last of it! 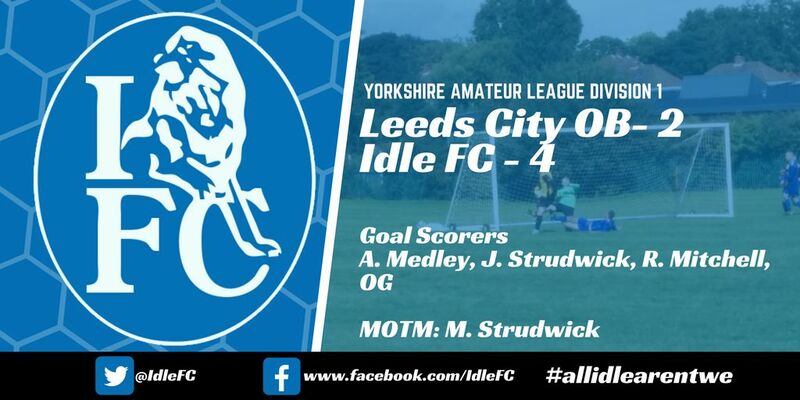 Idle were defending well and hitting Leeds City on the counter-attack, with Irving, Medley, Mitchell and J. Strudwick attacking with pace and precision. Despite the pressure from the home side, Idle managed to extend their lead and this time it was Mitchell who got the goal he deserved. Sprinting onto a through ball and rounding the keeper who had come flying off his line to try and clear the ball. Although he was forced wide, the Idle man was calm and composed as he picked his spot from a tight angle to make it 1-4. Idle were in complete control now with time ticking away, however, Leeds City were not about to roll over as they kept attacking, pushing to get back in the game. The home side did manage to grab another consolation goal with a solid header from the substitute forward but it wasn’t enough in the end with Idle seeing the game out and securing another vital 3 points.